If you were watching the Cathedral of Learning falconcam around 12:20pm today you saw Hope lay her fourth egg of 2018. I happened to be away from my computer so I missed it. Thank you to Jennifer, Debbie Key and Carol D. for letting me know. If this is her last egg, then she probably began incubation yesterday. Add 32 days to yesterday’s date and you’ll get an approximate hatch date. However, only Hope knows if she has a fifth egg coming. If she does, then she’ll delay incubation and that will delay the hatch date. Watch the Pitt peregrines here on the National Aviary’s falconcam at the Univ of Pittsburgh. 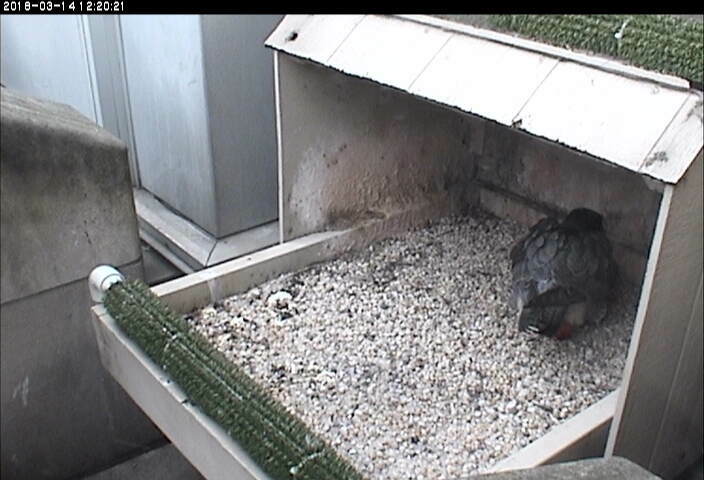 Even if 69Z will lay a fifth egg, the fourth would be the penultimate and she should begin incubation now. Unless of course she intends to lay 6, Ha Ha! It does not work can ‘t get on Pitt camera what is going? Do we have to pay to get on? Elaine, please try the tips I sent as a link my previous reply. You don’t have to pay. Kate, checking on the camera at the cathedral, the time was off by about 40minutes. There was no one on the eggs! Did you not say once the 4th egg was laid they would be staying on them to start the incubation? It is bitter cold , does that not cause concern? Patricia, this afternoon the snapshot camera stopped working for a while. Maybe you saw an old frozen-in-time picture that did not change, snapped during a quick nest exchange.